Can you believe I have never actually had a cheese ball until I made my first vegan cheese ball just the other day? True story. So let’s see, what are the cheese ball requirements. Smooth and creamy, check. Flavourful and addictive, check. Festive colours, check. Easy to make (and can be made ahead of time), check. Want to devour the whole thing immediately, double check. 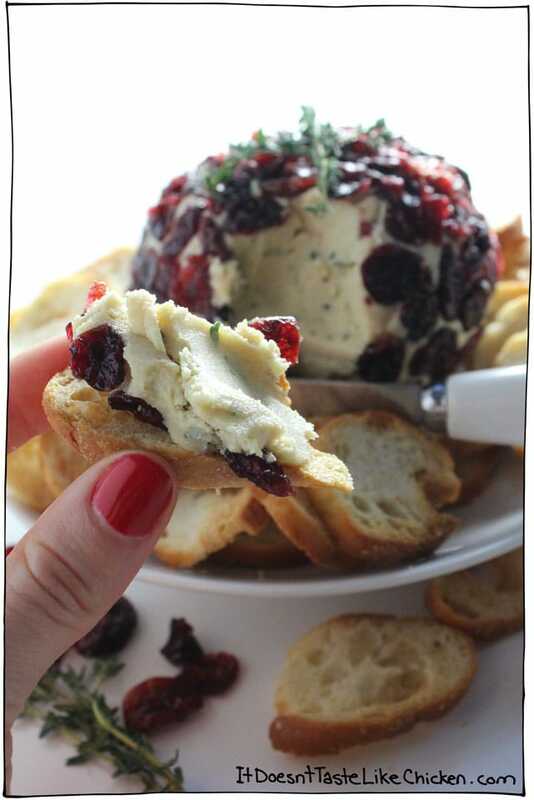 Welcome Cranberry & Thyme Vegan Cheese Ball, you are my new favourite addition to the appetizer table. So it’s true, I am new to the world of cheese balls. I experimented with one for my family Christmas the other day, and while it turned out pretty darn tasty, it somehow seemed to absorb the colour of the pecans I used and turned kind of a pâté brown. Yuck. Then when I went to sample some, a family member warned me not to eat it because it was meat. Haha! Regardless of the funny colour, the whole thing was devoured, and considering there are only 3 vegans in my family of 44 people this year, that means a lot of omnis were digging it too (and thinking it was meat apparently). So I knew I had something, I just had to improve it. A little experimenting in the kitchen, skip the pecans and welcome to this ridiculously good cheese ball love. The colour is a creamy soft yellow with little specks of green thyme throughout, and the cranberries on the outside make it super pretty. No yucky brown going on here. The flavour took several steps up too. The combo of the cashews and coconut oil make it so smooth and creamy, it’s kind of ridiculous, and lemon, miso paste, and nutritional yeast add a gorgeous zing of flavour. Agh! I want it now. I am just so totally into it, and really had to fight myself from polishing off this entire ball mid photo shoot. 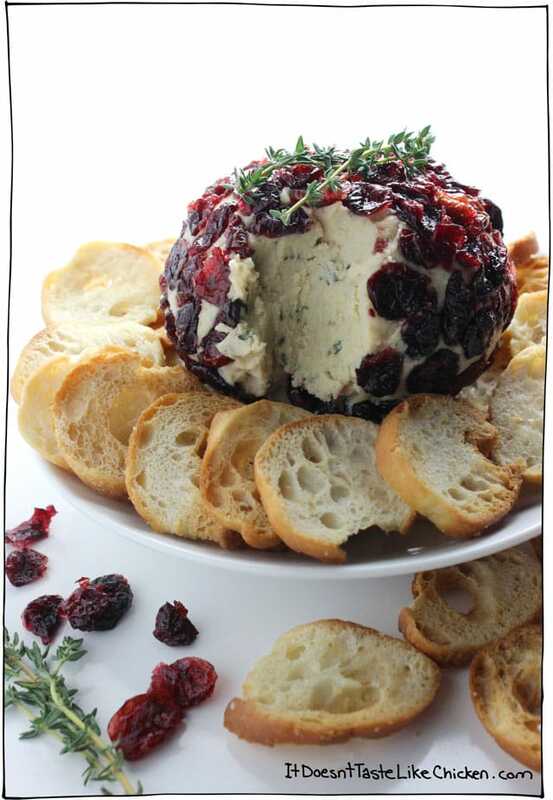 So lets get making this vegan cranberry & thyme cheese ball! You can either boil the cashews for 10 minutes or soak them for about 4 hours until they are nice and tender. Then just drain the cashews and add to a food processor along with the lemon juice, nutritional yeast, coconut oil, white miso paste, garlic, and salt. Blend until very smooth and creamy, stopping to scrape down the sides as needed. Now add the thyme leaves and blend to combine. Cheese done. See, so easy peasy. 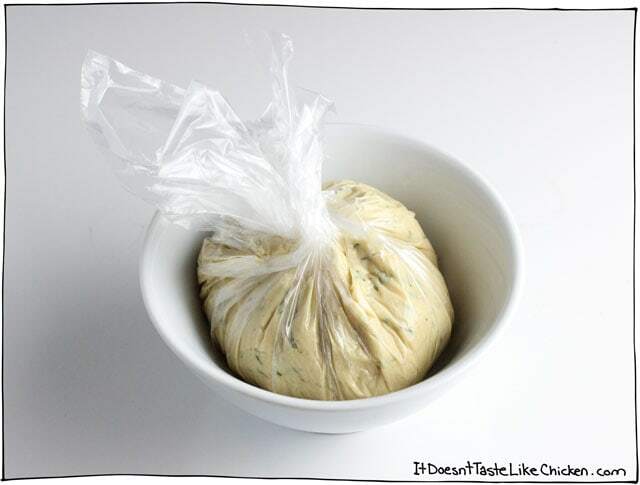 Line a small bowl with plastic wrap, and scoop the cheese mixture into the bowl. Gather up the sides of the plastic wrap and twist to form a ball. Let the cheese ball firm up in the freezer for about an hour, or for a couple of hours in the fridge. Then it will look something like this. The magic of coconut oil, ooooh ahhhh. 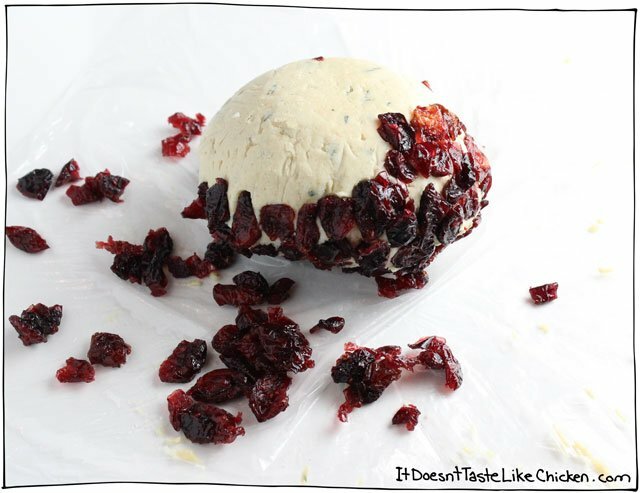 Remove the now firm cheese ball from the plastic wrap, and press the cranberries onto the outside of the ball. You can try to do this with handfuls of cranberries, but I found it easiest to just take my time and press in one cranberry at a time. It really didn’t take that long. Tah dah! If your ball is kind of a funny shape, you can lightly pat it into a rounder shape. Serve it right away, or just store it covered in the fridge until you are ready to serve. You can definitely make this ahead of time. Garnish with thyme sprigs and serve with crackers. This is the BEST VEGAN CHEESE ever!! Just 9 ingredients and so easy to make. So smooth, creamy, and flavourful everyone will love it. Perfect appetizer for any party. You can either boil or soak the cashews. To boil the cashews: add the cashews to a small pot, cover with water, and boil for about 10 minutes until the cashews are very tender. To soak the cashews: add the cashews to a bowl, and cover with water. Let soak for 4 hours or longer until tender. 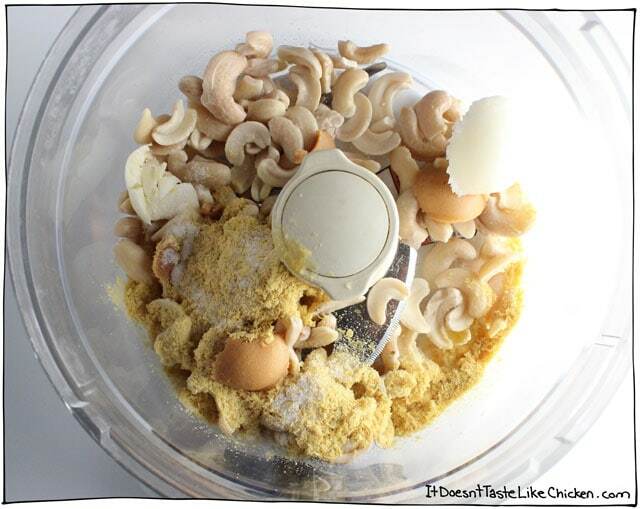 Drain the cashews and add to a food processor along with the lemon juice, nutritional yeast, coconut oil, white miso paste, garlic, and salt. Blend until very smooth and creamy, stopping to scrape down the sides as needed. Add the thyme leaves to the food processor and blend to combine. 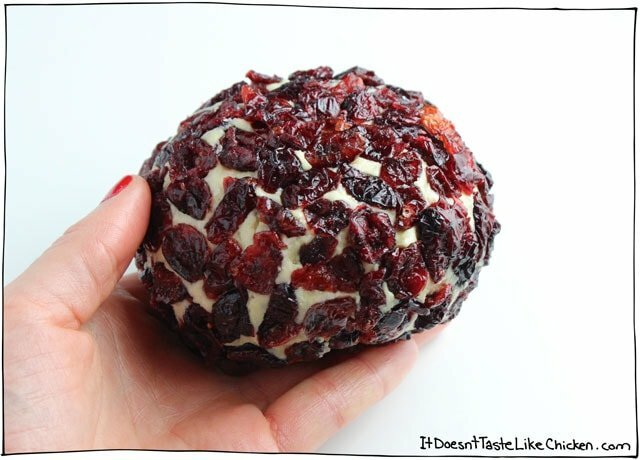 Remove the now firm cheese ball from the plastic wrap, and press the cranberries onto the outside of the ball. You can also lightly press the ball to get a rounder shape if desired. You can serve it right away, or keep the cheese ball covered in the fridge until you are ready to serve. Garnish with thyme sprigs and serve with crackers. Hi, How big a serving is 162 calories? Thanks. You could use chickpea miso. Enjoy! This was amazing! I used to love cheese and crackers and haven’t found a good vegan cheese that I actually find worth buying. I don’t need to look in the store anymore, I’ll keep making this. SO good! I made this as an appetizer for all the Christmas dinners last year, and it was a hit! Everyone loved it, even the ones most suspicious of vegan cooking, lol. I left out the miso since I did not have any. Personally, I did not enjoy it too much due to the strong coconut flavour as I am no coconut fan. But I think I’ll make it again with miso and a more refined coconut oil that does not taste of coconut as much. Thanks for the recipe! I just tried making this and it tastes good but I can’t get it creamy enough like you have in the picture. How do you get your’s so creamy? Make sure your cashews are very softened so they will blend easily, then make sure to keep blending until it reaches a very smooth and creamy texture. Check out the video above to watch me prepare the cheese. This cheese looks amazing! I would like to know, is it possible to change the form? As a christmas tree? If so, would you suggest to put it in the plastique wrap first and shape it after? Thanks!! Absolutely! You could push the cheese into any shaped dish, and yes, be sure to line it with plastic wrap so you can release it easily once it is set. Enjoy! This looks delicious! Question – how important is the miso? 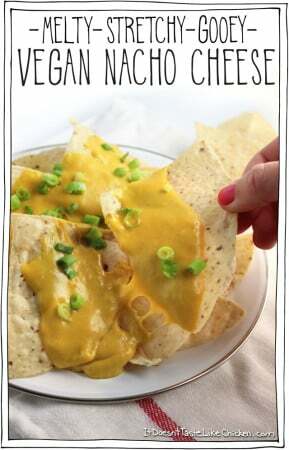 I’ve never attempted vegan cheese, so I’m not sure what the miso flavor adds. Thanks! The miso adds a fermented umami taste and is what helps make it taste like an aged cheese. So I think it’s important. Enjoy! This recipe looks amazing! My son has a soy allergy so we are going to try it with sundried tomatoes like some of the other reviewers mentioned and replace the thyme with basil. I’m thinking I’ll then cover the ball with a vegan pesto and some chopped sundried tomatoes for a festive holiday look… hoping it tastes as good as the original recipe! One question – what kind of coconut oil do I use? There are so many different types and I never know which one is right. Thanks for your help! Sounds delish! My go-to is refined coconut oil which has no taste. Enjoy! Oh my goodness!! What is cheese! Forget cheese!!! I’m not going to miss cheese at all. My kids wanted to eat the whole thing from the blender. Made this last night. I had dark miso for the longest time, but I just bought white miso and WOW it will be my staple for now on. I feel like it gives that perfectly aged taste I loved in cheese. I didn’t have the cranberries, but I couldn’t wait to try it. I took it out of the fridge too soon (about an hour a few minutes after sticking it in) and it had hardened up a bit but was still soft, It was really good though! Woke up this morning and it has a much firmer texture that makes me very, very happy. I haven’t been disappointed by a recipe of yours yet. Thank you! That’s wonderful, Kari!! Thrilled you love the cheese so much. 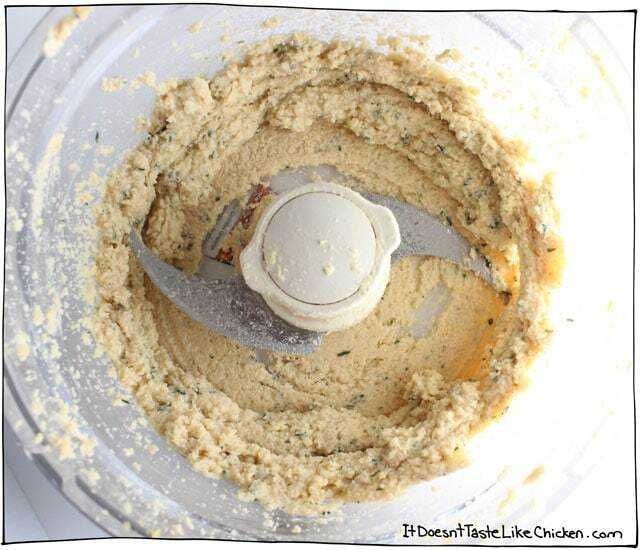 And yes, white miso paste is magic in vegan cheeses!! What can I substitute for the coconut oil?Several people in the family have an allergy to coconut. Coconut oil has the unique quality of getting very firm in the fridge and holding its shape at room temperature. It’s what gives the cheese its texture, so I am afraid there isn’t a great substitute. The only thing I can think of would be vegetable shortening, but I don’t know how well that would work. Hope that helps! This looks amazing and would love to try it for Christmas. My son can’t have nuts though… is there a seed or grain I could substitute the cashew with? If not I might just have to make it just for me! I haven’t tried it with anything other than nuts, so I am afraid I’m not sure. Sorry, I can’t be more help! I made this over the weekend, and when my 15 year old daughter took her first bite, she went wide-eyed and said, “Mom, I think I love you even more”. lol Needless to say, it was an absolute hit! We omitted the cranberries (my husband and daughter aren’t a fan of them), however, I added a dollop of red pepper jelly on top of my cracker and “cheese”, and it was INCREDIBLE! I’m making this cheese ball for thanksgiving appetizer… I’d like to make it 3 days ahead stored in fridge…is that too long. Any idea what a serving size is for this? Well, I could eat the entire thing myself, but I would say this could serve 8. Enjoy! I just made this cheese ball with a few tweaks. I couldn’t find white miso paste so just used regular miso paste and instead of thyme/ cranberry, I used chives/ almonds. It is soooooo delicious. Not very cheesy, more earthy and I perhaps added a tad too many chives but still totally moreish. I will definitely be experimenting more. I love how you can pretty much slice it and spread. You are awesome! It’s the first time I feel compelled to write a comment on a food blog. At last, I’ve finally found a vegan cheese I like! I just had some tonight on crackers and with a glass of wine – perfect. Your recipes in general are genius (I’ve made many)! I loooove your cottage cheese and make it regularly and your mac n cheese powder is also amazing, oh, oh, and your tofu bites – oh those tofu bites! Can’t stop eating them if I make some (maybe I need to go write a review with those recipes too?). Thank you so much for your enthusiasm and your delicious recipes. From a fellow Canadian living in the UK. Sam, This looks soooo good. We have cashew allergies. Is there something else we can use as substitute? Sometimes white beans or sunflower seeds have worked but I am curious about your ideas. Thanks. Thank you for answering so quickly. I’ll try it this weekend. Sam, have you tried making this without the miso paste? Or is there a substitute you might recommend? Miso paste is key for an aged umami cheese taste so I would recommend it. Enjoy! Dear Sam, I just discovered your site and I’m already hooked. I heard that coconut oil has a lot of saturated fat, more than butter and crisco, and should be avoided if you have high cholesterol (like I do). Any recommendations for substitute? canola oil maybe or safflower? Welcome, and thank you so much, Andi! Unfortunately, this cheese ball relies on the unique properties that coconut oil has, being solid at room temperature, to hold the cheese together. So there isn’t really a substitute here, and I would recommend trying a different recipe instead. You can check out all of my recipes that are completely oil-free here. This sounds amazing!!! Definitely going to try this. I may try using chives instead of thyme, only because I have a chive obsession. Any suggestions on what would be good for the exterior to compliment chives? Mixing this up Christmas Eve. We are a bit of an omni / vegetarian family…with vegan leanings. I am sure everyone will enjoy this. The leavings in the food processor are delicious. 🙂 Can’t wait to dress it up with cranberries. 4 stars for prep. Will see about flavour with the family, Christmas Day. Amazing. I see from all the comments that this recipe was posted years ago, but I’m a new baby vegan within the last couple months and I tried it for the first time tonight. It almost didn’t make it into the bowl to get cold because I couldn’t quit sampling as I transferred it from the food processor. Luckily the rest of the family will get a small amount tomorrow when I serve it. Yum. And beautiful. Thank you, Sam! Right you are, Sam! It seems like every day I am eager to try a new recipe. If I could just retire from my job I could play all day in the kitchen. Thank you so much for all your efforts and your delicious contribution to our lives. Your new cookbook is sitting under the tree right now – a present to myself. :)) Merry Christmas to you and yours. I am a professional chef and I made this at a large event for 700 people, then brought some to my mom who has many allergies. Everyone, meat lovers and vegans alike LOVED this. The miso is hat key ingredient to make it have an “aged” taste like cheese. Spot on recipe. Can you use double layered cheese cloth instead of plastic wrap and refrigerate it? You could try but the cheese might be a bit too liquid before it sets so it might seep through and be difficult to remove. This looks great, but I have a brother who is allergic to coconut. What, if anything, could I substitute in its place? Unfortunately no, the coconut oil is key in this recipe as it has the unique quality of being firm at room temperature which is what helps this cheese hold together. Thank you! I’m bummed, but I can make it for other occasions where my brother isn’t around. I want everyone to be able to enjoy what I make this weekend. Hello! Just wondering if Yellow Miso paste can be substituted for the White Miso paste and how the flavor would compare. Thanks so much! Hi Amy. Yes, it can. Yellow miso paste will change the colour of the cheese, and it also has a bit more of an earthy taste. I am sure it would still be yummy tho. Enjoy! I made this yesterday. It’s my first attempt at making a vegan cheese ball. It worked and it’s beautiful. I made this about a month ago and loved it. It’s a beautiful centrepiece for a snack table, I almost didn’t want to eat it because it was so pretty! I’m glad I got over that though because it tastes amazing! So creamy and savoury! We quickly realised though that it’s pretty filling and there was no way I was going to get through it in a few days so I froze half. Just had the rest of it today and it was exactly as delicious as it was when I first made it. So I can confirm it freezes well for a month at least, cranberries and all. Just thaw at room temp or even in the fridge, though that takes longer and who wants to wait?! Thanks for this wonderful recipe Sam! Thanks for the info on freezing. I have someone who wants me to make this for her for Christmas so I wanted to freeze it for her. We don’t have cheese balls in South Africa so this will be an interesting centrepiece for her! I made this recipe as part of an all Vegan hot appetizer feast for my fella’s birthday and it was a HUGE hit. Because we had a large crowd coming, I doubled the recipe and it was gobbled up. I love that is can be customized. I didn’t have fresh thyme but did have chives. Next time, I may coat it with nuts or a different dried fruit. 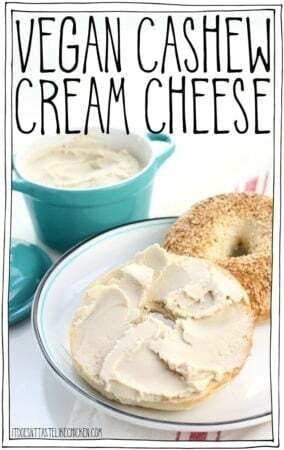 I also love that it can be used as cream cheese. So amazing! Thank you for always being an inspiration. Made this up last night. It was so easy and tastes great. Being the only vegan in my family for just over a year now and I can’t wait to share this with my carnivorous family today! Everyone loved it. Thanks again Sam. Made this cheese this afternoon and oh myyyy! How perfect and delicious ! Gonna post it on Insta. I am wondering whether aquafaba could be substituted for the coconut oil as I can’t do oil? The cheese ball needs a binder to hold it together – so am just wondering what if anything could be substituted for coconut oil ? I’m afraid not. The coconut oil here isn’t used for a binder, it’s really more to firm up the cheese as coconut oil turns solid in the fridge. Aquafaba would not work the same way. You could skip the coconut oil, but the cheese would be a softer spread and not a ball. Hope that helps! Could tapioca flour or agar take the place of the coconut oil? My fiance is allergic to coconut, so we’ve been trying to find vegan cheeses that are made without it, and this just sounds tooo good. The magic of coconut oil is that it is solid at room temperature, so that’s what is key with this recipe. I would say the closest thing you could try to substitute it with is vegetable shortening. Your cheese might be a tad softer, but I think it would work. Enjoy! I’m really loving the theme/design of your blog. Do you ever run into any browser compatibility issues? A few of my blog readers have complained about my blog not operating correctly in Explorer but looks great in Firefox. Do you have any tips to help fix this problem? Would this work with almond meal (I’ve used it for your mozarella before)? To replace the cashews? Yes, I think that would work fine, just make sure it is blended really well so it is smooth and creamy. If you give it a go, let us know how it turns out! So excited to try this. Just wondering if you’ve tried freezing it? I’d like to make it ahead of an event. Thanks for the great recipe! This looks interesting. Though I cook without oil (not that this is cooked). Is it possible to skip coconut oil of will it not hold together? I made this for Christmas eve and it sat next to the Cheese Ball Supreme my family traditionally has – with cream cheese, cheddar cheese, ranch dressing and pastrami. Yes, we find a way to put meat in everything in Texas. At the end of the night, mine was gone. My uber meat eating family loved it and told me it’s a keeper for next year. Thanks so much! I used to love the one we had and was feeling sad I wouldn’t eat any of it this year. Now I have an option that everyone else likes too! Where do you find is locally? When I look online it sales by the pound – does it go bad fast? I found it in my local grocery store in the Asian section. If yours doesn’t carry it, any healthy food store definitely will. It is a naturally fermented product, so just keep it in the fridge and it stays fresh basically forever! One tub can last you a very long time. (That said, once I fell in love with the flavour I started using it in dressings, soups, and all over the place). 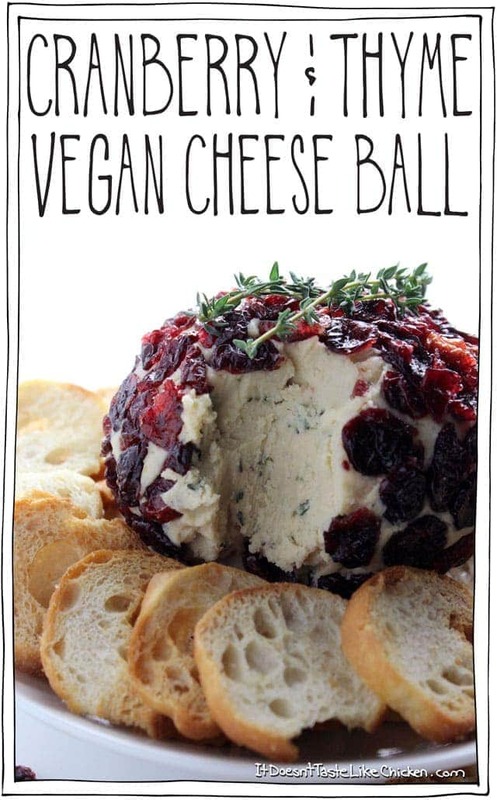 i’ve never had a VEGAN cheeseball, but my interest is definitely piqued! it looks like it has the perfect texture, that’s for sure. I did make this, and it was wonderful. When you said the pecans turned it brown, did you add pecans to the mixture or roll the ball in pecans? I was thinking of trying the latter as a variation because the combination sounds so tasty. So happy you enjoyed it Walt! I did both actually, and also included some cranberries in the mixture. It set overnight which I think made the colour from probably both the pecans and the cranberries seep in more. If you just coat the ball in pecans I am sure you won’t have that problem. Enjoy! Aww so happy you and your fan loved it! Merry Christmas to you as well. Many exciting things to come in 2016! This looks very tasty. I don’t have any dried cranberries or thyme leaves on hand, though (guess I could go shopping but it is Christmas Eve). What to do, what to do. . . . I made today and it turned out very well. The “cheese” tastes like fondue! I forgot to add the thyme, but it was great nonetheless. Thanks for sharing. This looks absolutely delicious. 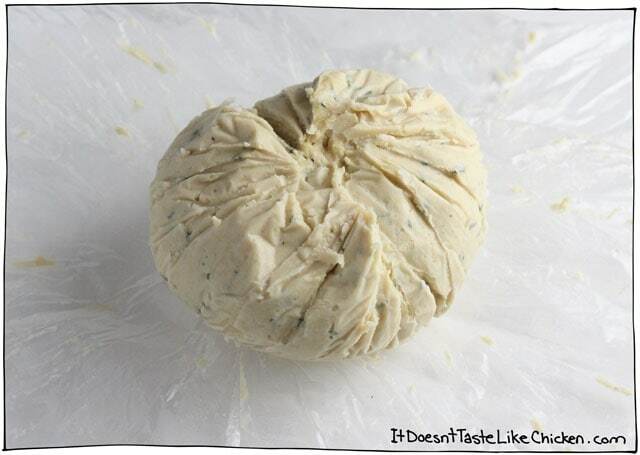 I’ve been trying to find a great vegan cheese ball recipe and I will give this a try. Thank you for sharing this awesome recipe. So pretty and festive … and KIND! Thank you, love! Looks really good…..but allergic to miso. Any ideas to replace?? Chickpea miso is an option if it’s the soy you’re allergic to. No….unfortunately it is the culture that we are allergic to. And that is in all misos….so wondering if there were something to sub for it. thanks for getting back to me. I really appreciate it. Maybe try sundried tomatoes? They have a nice umami flavor to them. It’ll turn the cheeseball into a slightly different color and I’d rethink the cranberries, but maybe top with more sundried tomatoes. So very excited to try this for Christmas. 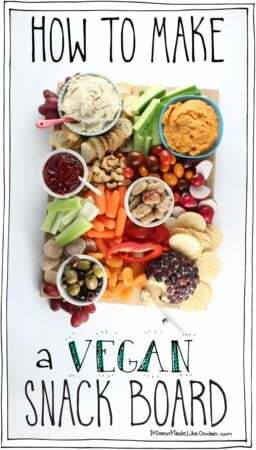 I am mostly vegan and my son is GF and now dairy free also for health reasons I know we are going to enjoy this thank you for making it so easy. You’re very welcome Meg! I hope you and your son love it! How wonderful! I’m cooking entirely vegan Christmas meals for the first time this year. I was trying to figure out something for a “snackish” lunch in between the gargantuan breakfast and dinner I’m fixing. This will be so festive and perfect! Thank you!